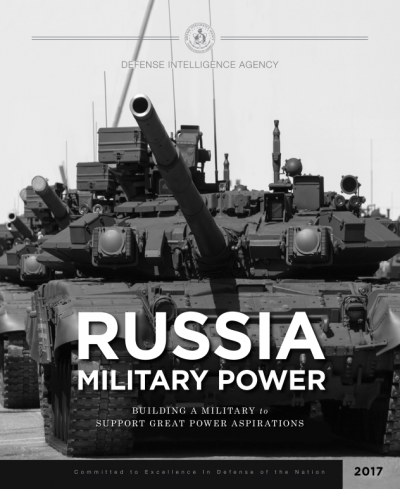 „The Defense Intelligence Agency (DIA) today released “Russia Military Power,” a report that examines the core capabilities of the resurgent Russian military. It is the first in a series of unclassified military power assessments on major threats facing the United States. The series of reports are designed to help the public achieve a deeper understanding of key threats to U.S. National Security and will focus on DIA’s five “no fail” missions, which also includes China, North Korea, Iran and transnational terrorism. “These products are intended to foster a dialogue between U.S. leaders, the national security community, partner nations, and the public about the challenges we face in the 21st century,” said Lt. Gen. Vincent Stewart, DIA director. The resurgence of Russia on the world stage – seizing the Crimean Peninsula, destabilizing eastern Ukraine, intervening in Syria, and shaping the information environment to suit its interests – poses a major challenge to the United States and its allies and led to the development of these “military power” publications. “Within the next decade, an even more confident and capable Russia could emerge. The United States needs to anticipate, rather than react, to Russian actions and pursue a greater awareness of Russian goals and capabilities to prevent potential conflicts,” said Stewart. DIA has a long history of producing comprehensive and authoritative defense intelligence overviews. The first unclassified Soviet Military Power assessment was published in 1981 and was translated into eight languages and distributed around the world as an annual report in the 80’s, until the fall of the Soviet Union in 1991. The 2017 military power report series includes analysis of foreign national security strategies, military doctrines, force structures, and core military capabilities, including nuclear forces, biological and chemical weapons, underground facilities, space/counterspace and cyber operations. The report can be downloaded from the Defence Intelligence Agency website. See also: „Russian military capability is strengthened and increasing“ from the Swedish Defence Research Agency (FOI).